Face of Jules uses the bt-micro® skin scrubber from Bio-Therapeutic. This powerful skin spatula creates high-speed ultrasonic oscillations. As it’s moved across your skin, the oscillations of the spatula’s peeling probe safely but effectively scrape away dead skin cells and any congestion on the outer layer of your skin. Not only does this reveal smoother, fresher-looking skin, it also clears the path to new skin that is significantly better able to absorb serums, moisturizers, and more. As a result, any following facial treatments our skilled esthetician Julia uses on your skin will be more effective. As it moves across your skin, the flat surface of this ultrasonic skin scrubber pushes dirt and oil up from your pores, then scrapes it away. The oscillation of the spatula can help any cleanser that is applied during your treatment penetrate into your pores more deeply, ultimately giving you cleaner, clearer skin. While the skin spatula is an amazingly effective standalone skin scrubber and exfoliator, it’s also a powerful preparatory device. When used before other facial treatments, it clears away the outer layer of skin so the next treatments can penetrate more deeply, helping them become more effective. 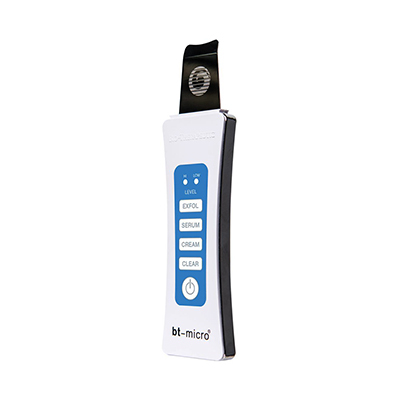 The bt-micro skin spatula can also be used in the actual application of moisturizers and serums. Its ultrasonic movement encourages the penetration of those topical treatments into the skin. In fact, the skin spatula has been shown to increase the penetration and absorption of creams, serums, moisturizers, and more by as much as 75 percent. The bt-micro skin spatula is designed with your comfort and safety in mind. Its innovative technology can deliver the same exfoliating and skin clearing effects as microdermabrasion, but without the need to use abrasive crystals or suction. As a result, it can be a better option for people with sensitive skin, especially those with facial skin that is prone to redness or rosacea. Are you interesting in getting your smoothest, clearest, brightest skin ever? 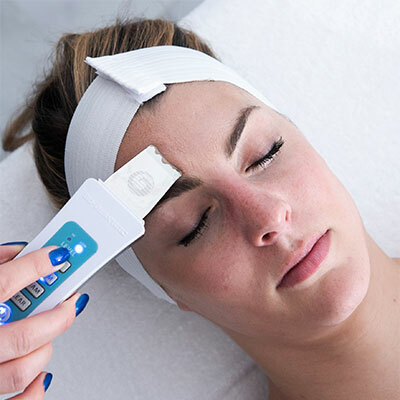 Face of Jules can use our bt-micro ultrasonic skin scrubber to clear away old skin, clean out pores, and help serums and moisturizers penetrate for your healthiest, most even, best looking skin. If you would like more information or would like to schedule your appointment with Julia, please contact Face of Jules today. Treat yourself to a quality treatment with our ultrasonic skin scrubber.